At the 2013 Los Angeles Auto Show, Subaru unveiled the Legacy concept — a preview of a production model set to be unveiled in 2014. Today the company has released the first teaser image of the all-new Legacy, which will be unveiled on February 6th at the 2014 Chicago Auto Show. Few details were released about the new Legacy, but the teaser image reveals a sleeker, more coupe-like profile with a faster windshield rake and narrower A-pillars that create a sporty and modern sedan. We’re not too sure how many design elements from the concept will be carried over into the production version, but we will really like seeing those cool hawk-eye headlights and taillights. Under the hood, rumors suggest that the 2015 Legacy will get an improved version of Subaru’s famous boxer engine. We also expect to see Suby’s Symmetrical AWD (S-AWD) system and a CVT. 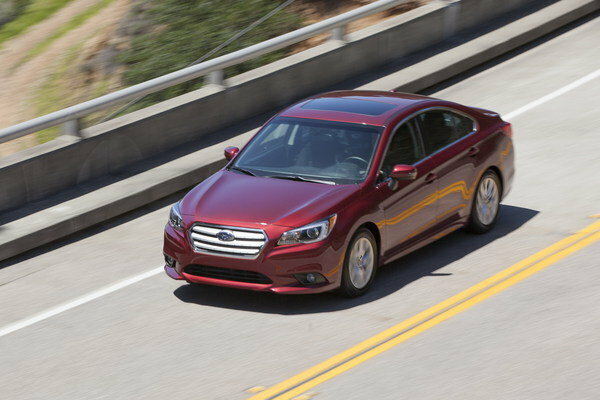 Updated 06/01/2015: Subaru announced prices for the 2016 Legacy which will arrive at dealerships later this summer. As the model was completely redesigned for the 2015 model year, no changes were made for 2016, except new Subaru STARLINK™ Safety and Security features. Prices will start from $22,540, including destination and delivery. Subaru Legacy originally appeared on topspeed.com on Monday, 1 June 2015 14:00 EST.